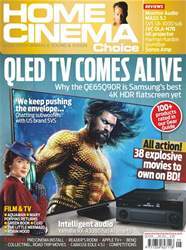 Samsung’s QLED TV technology isn’t new, but this year it’s aiming for a performance upgrade via improved processing and panel design – we put its flagship Q90R 4K HDR TV through its paces in our lead review. 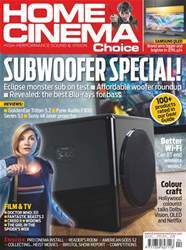 Also on the test bench is JVC’s DLA-N7B, which sees the brand bring its native 4K HDR projection expertise to a new price point, plus Monitor Audio’s living-room friendly MASS 5.1 sub/sat system; SVS’s 13in SB-3000 subwoofer; the Enchant 800 soundbar from Harman Kardon; Yamaha’s nine-channel RX-A3080 AV receiver; Sonos’ new streaming Amp; and more. Whatever your budget, we’ve got you covered. 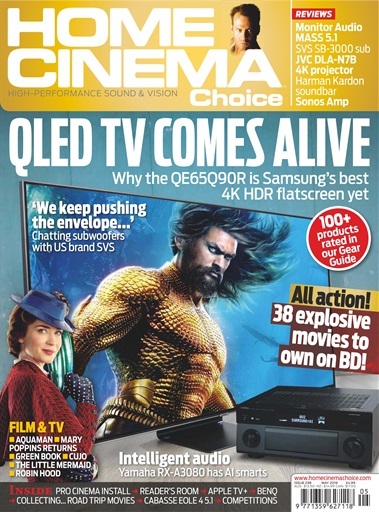 On the software side, we celebrate 20 years of The Matrix by revisiting 38 classics of action cinema from 1980s cop capers to Marvel blockbusters, and check out new Blu-ray and 4K releases including Robin Hood, Aquaman, Mary Poppins Returns and Mortal Engines. In honour of new flick Green Book, we also round up 10 more cracking road movies on Blu-ray and DVD. 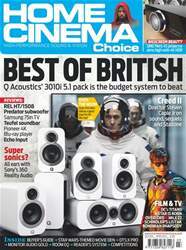 Plus all the usual opinions, news, disc reviews and competitions. Enjoy the show!